The Transport is responsible for terrain traversal, excavator device deployment, regolith transfer, and regolith deposition operations. 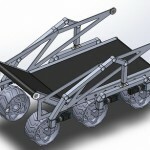 Rocker bogie suspension system provides quasi-static stability for 0.3 m diameter obstacle traversal, mitigating requirement for computer vision obstacle avoidance. 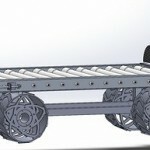 Articulating drive wheels provide 1.2 m wheel base to prevent tipping, 0.6 m wide channel for obstacle clearance, and variable 1.2 m long conveyor belt enables excavator surface deployment and regolith deposition between 0.3 m and 0.7 m above surface. 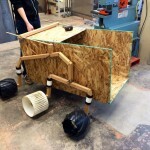 In addition, the articulating wheels allow the system to arrive in a packaged state and unfold to achieve a larger wheel base. Complexity is an issue for this system. 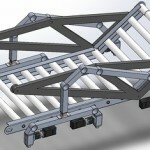 A conveyor system was chosen as a solution to both cache, transfer, and deposition systems. This system is implemented on both devices. The excavator uses a static conveyor belt with deployable walls to hold in more material, and the transport uses a dynamic conveyor belt which can articulate down and up to deposit material in the collection bin. By using two conveyor belts for transfer and deposition, the docking and transfer procedure is accomplished by aligning two long lines on both devices and actuating both belts to move material. 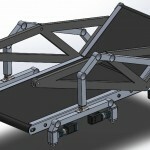 The transport conveyor can articulate down to the ground if necessary.